Did you know that temperature and humidity affect your health? With too much moisture in your home comes an increase in allergens, fungi as well as airborne chemicals. On the other hand, dry air is a perfect home for viruses, whilst drying out your skin and eyes. However, thanks to the advancement of technology, a weather station might just be the thing you need. It can help you get the right balance of temperature and humidity, helping you avoid these problems. The buying guide below details all the info you need before buying, while the weather station reviews will help you compare and contrast some of the top products on today’s market. The most basic weather stations offer temperature and humidity readings at the very least. More expensive items include additional readings for wind, rainfall or weather forecasts. Basically, you need to consider what measurements you want, the accuracy level and how much you want to invest. An ability to record data, make charts and graphs might also be important to you if you want to make adjustments in your home or greenhouse. This data can also be helpful to make future predictions regarding various weather patterns. An easy, fast setup thanks to high-quality instructions and user-friendly interface is a must for the majority of buyers. However, you also need to think about where you can place this weather station. Consider if the station comes with an included stand or not, check the wall-mounting ability and if the needed tools are included in the package. Also, check to see if there are any additional attachments or plug-ins required for optimal functioning. Check how you can power the weather station too: via battery, wall socket, USB or solar power. Are there more options to make it work or not? Wireless connectivity is essential for connecting to different weather channels, for gathering data regarding past weather forecasts or for allowing you to publish data online. As such, make sure you have a backup solution in case the wireless doesn’t work. A well-lit display is essential for night-reading, while a colourful display with a true-black background is essential for daylight. Better displays usually come with a price increase, but lesser quality displays don’t decrease the basic functions of your weather station – they’re just irksome. As such, the issue of the display comes to a choice between paying a little extra for easy readings or doing some extra tilting or lighting to save some money. This determines where you can place the weather station on your property because it tells you how far the outdoor sensor can be from the main station. If you have a large property and want to get measurements from your greenhouse, you need a bigger line of sight. Otherwise, 50-100 metres will do just fine for most home purposes. You should also check where you can install the weather station. Outdoor sensors might need to face bad weather, so make sure they’re rainproof and securely mounted. Otherwise, you need to create the right conditions for these sensors, without affecting the accuracy of their measurements. There are different types of weather stations on the market, each with its particular set of features. That’s why you should take into account the factors above when you’re reading the following reviews, so you can make an informed choice. The Youshiko YC9350 weather station is one of the most affordable on the market, sporting some basic features. Along with its radio controlled clock, a good feature is the animated weather trend display, as well as the alarm for frost and ice. The features of this weather station are indoor and outdoor temperature measurements, as well as humidity measurements. Although you get a min/max display for these measurements, the ones regarding humidity aren’t extremely accurate. With a measuring range of -40°C to +70°C in Fahrenheit or Celsius and 20% to 90% RH humidity, you also get an accurate clock, with automatic time changes, an alarm with a snooze function and a LED display. Although the blue-black backlight of this display makes it easy to read in shade, it’s difficult to see the exact figures in full sunshine. The wireless sensor can be as far as 50 metres from the primary weather station, and it can display measurements for up to three locations. The wireless sensor is splashproof and can be mounted on a wall or placed on a table. If you choose to wall-mount it, the disadvantage is that it only has one screw hole, which isn’t extremely secure in inclement weather. This can be easily fixed, though, if you stick it with a piece of blue tack for extra securing. This is another good weather station manufactured by the same company. 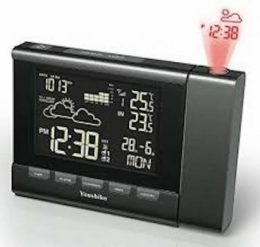 It sports the same quality features as the model above, like the radio controlled clock, animated weather trend display, alarm for frost and ice and automatic time changes. But there are some important differences. For instance, the temperature range is different here, considering the indoor temperature can be read between 0°C to +50°C, and the outdoor temperature between -20°C to +60°C. The humidity indicator is also more accurate here, but the temperature readings aren’t as exact. The alarm system is also different, considering it’s a dual alarm. There are also accurate sunrise/sunset/moonrise/moonset times, but the blue-black LED display is similarly difficult to read. The splash-proof wireless sensor that can be placed 50 metres max from weather station is difficult to secure on the wall with just one screw. This SensorPush wireless thermometer and hygrometer is specially designed to work with smartphones, with an iOS 8+ or Android 4.3 operating system. It’s one of the lightest and most compact such devices on the market. The 99 metres line of sight is quite powerful, so you can mount it pretty much anywhere on your property. However, keep in mind that the outdoor sensor isn’t water-resistant in any way, so you need to keep it safe from rain. The design is user-friendly, with an easy installation and easy readings so you can monitor all the stats that interest you. The readings can be pushed on your other devices via Bluetooth, and you get various alerts if any issues arise. The sensor is accurate too, but it doesn’t connect directly to your Wi-Fi without buying a separate receiver. It would also be great if you could recharge this device with a USB. 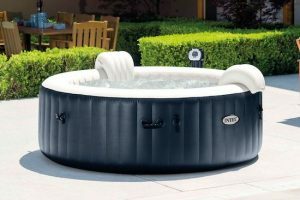 However, the price is affordable and all its main features are quality. This Youshiko weather station has some improved features when comparing it to the previous models of this brand. For instance, its LCD display is larger, clean and clear, and therefore easier to read without having to adjust the angle in full daylight. Unfortunately, it is difficult to read of in darker rooms, without having a light nearby. The 5-in-1 sensor is more accurate and can give you various readings, including wind speed and direction, rainfall, heat index, dew point, pressure, wind chill and Beaufort wind force scale, apart from the basic temperature and humidity measurements. Still, the sensor can’t really be secured on the outside wall with just a single screw to keep it in place, so don’t forget our advice about the blue tack. You also get a radio control clock with a UK version and the Moon phase, along with an accurate weather forecast. This device records minimums and maximums, as well as past 24-hour hourly data, so you can make accurate comparisons and hence better adjustments. On the other hand, the three AA batteries required for it to work aren’t included in the package. Another top weather station from Youshiko, this product has some different features when compared to others. However, the improvements come with an increase in the retail price. While there is no Beaufort scale measurement, the other data are just like the item above: you get temperature, humidity and heat index, dew point, barometric pressure, as well as wind speed, direction and chill. There’s a radio control clock here too, but no moon phase for the astrology or astronomy buffs. On the other hand, the other features are similar: there’s a comprehensive weather forecast, complete memory records with time and date stamps, as well as an hourly data record history, along with record high and low alert settings. The biggest improvement, however, is the colour-changing display. There are three colour modes, one with an auto-looping 256 colours, one with eight rainbow colours on a true black background and one that’s colour changing according to outside temperature. That way, you can read the display in any lighting conditions. The outdoor 5-in-1 weather sensor that’s extremely accurate comes with an included removable stand, but the wall-mount is equally difficult. The good news is that you get an extra CR2032 battery, as well as a DC 4.5V 300mA UK adaptor. This innovative and upgraded weather station retailed by Youshiko is one of the best on the market for home use thanks to its quality features. For instance, the YC90 6-in-1 sensor and YC80 thermo-hygro indoor sensor provide detailed and accurate information. The measurements regard indoor and outdoor temperature, humidity, comfort indicators, dew point, wind chill, heat index, Beaufort scale as well as UV. You are also getting a comprehensive weather forecast, calendar, time, moon phase, sunrise and sunset times, an alarm with an ice alert function, as well as complete recordings regarding rainfall and wind direction. This weather station is perfect for weather buffs who want to keep track of all this information, thanks to the Weather Underground web service, where you can publish all your data. Besides, the LCD display boasts a BTN true-black background and colourful readings. The downside is that this weather station needs extra securing for outdoor mounting in inclement weather. Besides, all these improvements come with an obvious price increase. This Davis Vantage PRO 2 Weather Station is one of the best weather stations thanks to its design and construction features. However, you can also use it for complete local forecasts, highs and lows, as well as various graphs and averages for a large array of weather variables. All these recordings can be done for the past month, months or years, without the need of pairing it with a desktop. However, you need the additional proprietary data logger attachment to connect to the weather networks. But this is one of the top devices for greenhouses because its outdoor sensor is wireless and solar-powered, although it comes with a battery backup. It also works at 300 metres maximum line of sight, which is quite a lot compared to similar products. Besides, there’s an additional cable in case you can’t use a wireless transmission. The fact that you can customise its readings according to your location is a definite advantage. You can read barometric pressure, indoor/outdoor humidity and temperature, rainfall, wind speed and direction, UV and solar radiation. But the real benefits for your greenhouse are measurements regarding leaf wetness and evapotranspiration. The basic functioning principle is that the sensor picks up the surrounding temperature, humidity or pressure, and transmits this data to the main console. The temperature sensor works either on batteries or solar energy and can read both indoor and outdoor temperatures. The hygrometer reads the humidity because it has a dielectric polymer layer placed inside a metal electrode, that can absorb water molecules from the air. If your device can correlate the humidity and temperature measurements, it can also give you a dew point. Your device may have a built-in barometer to measure the atmospheric air pressure. This sort of sensor employs a force collector to determine the force used by applying mechanical stress. It either uses a semiconductor or metal, which changes its electrical resistivity, resulting in a voltage output that its transformed in digital data for display. Wind direction and speed are measured with an anemometer. There are various types of anemometers, but they all employ the same principle: converting analogue voltage signals proportional to the angle of azimuth in digital data. The rain sensor for rainfall information measures every 0.25 cm of precipitation each time its 20-cm rain collector is tipped. The accuracy of your home weather station depends on various factors, such as the sensor quality and where you place it. Obviously, a more costly product from a trustworthy brand with good reviews is more accurate. Never be placed in direct sunlight. Not be blocked from the wind. Be at least 1.5 metres above ground or your rooftop. Be at least 15 metres from the nearest paved surface. At least 10 metres above the ground. The humidity sensor needs to be 15 metres away from trees or water, and the rain collector needs to be placed at least 1.5 metres away from horizontal clearances that create shadows. The surface type also affects measurements. For instance, asphalt and black shingles attract sunlight, so they measure higher temperatures than gravel and grey shingles, which are lighter and repel light. We reviewed and compared the specific features of some of the best weather stations for home use the UK market has to offer. Have you ever used a weather station before? What’s the main reason you’re looking to buy one for?